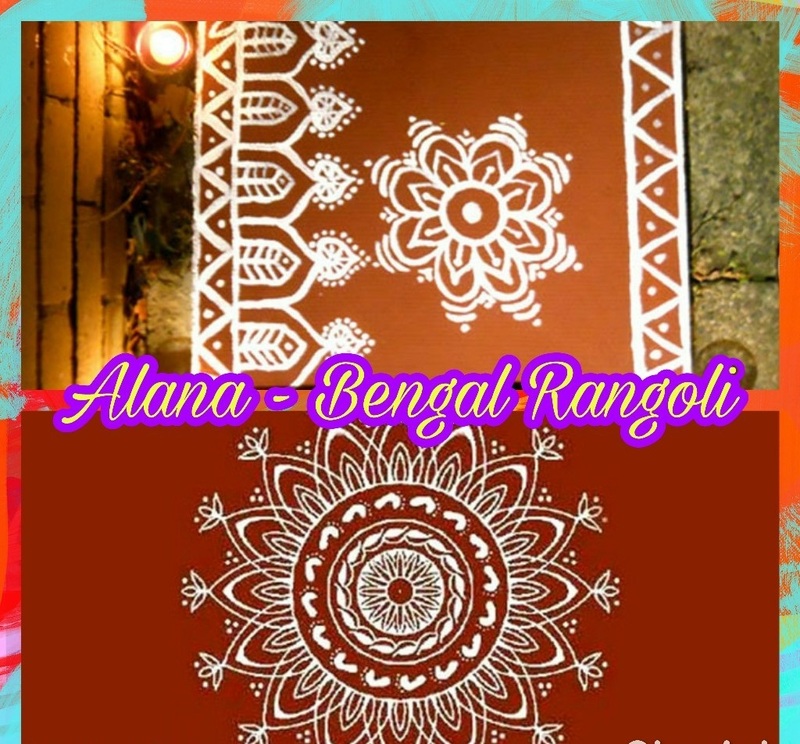 Alpana, is a form of Rangoli that is practiced in Bengal. It is a representation of the artistic sensibility of the people of that state of India. It is usually practiced by women and this art form represents an amalgamation of the past experiences as well as contemporary designs. The basic designs are more or less the same, only new forms and new colours are being experimented with along with a larger scale of design. The changing moods of the seasons are reflected very well in the Alpana designs. The word 'Alpana' has two different versions. As per one version, it originated from a Sanskrit word 'Alimpana', meaning 'to plaster with' or 'to coat with'. The other version traces its roots to the word 'Alipana', meaning the art of making ails or embankments. 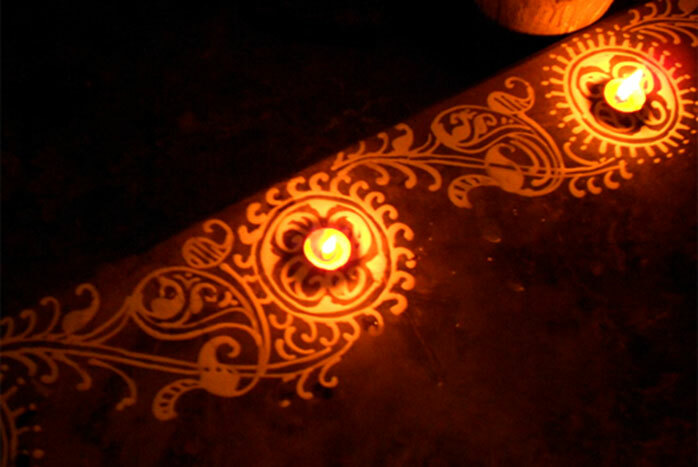 The art form of Alpana has been used since ages for religious and ceremonial purposes and is usually done on the floor. 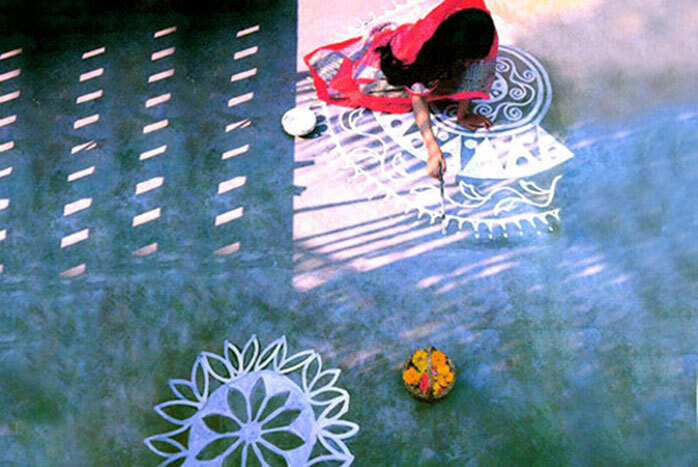 The Alpana patterns are a part of the sacred rituals and are made during the days when vratas (fasts) are kept by the Hindu women of Bengal during which the whole house and the floor are painted with Alpana art. The circular Alpana is very important and is drawn as a holy pedestal while worshipping a deity, especially during Lakshmi Puja. Drawing of an Alpana pattern. Some believe that the vratas with which Alpana is associated with can be traced to pre-Aryan times. The ascetics living in the country before the Aryans are said to have passed on this art form to the future generations. A detailed mention of Alpana paintings can be found in the later works like Kajalrekha. Alpana, is also believed to have been used by the agricultural communities of the region of Bengal for driving out evil spirits. Alpana designs use rice-powder, diluted rice paste, powdered colours (produced from dried leaves), charcoal, burnt earth, etc. Materials like coloured chalk, vermilion, flower petals, grains, etc, are also used to decorate these designs. The motifs usually comprise of sun, ladder, goddess Lakshmi, owl, fish, betel, rice stem, lotus, plough, sindur box, etc. 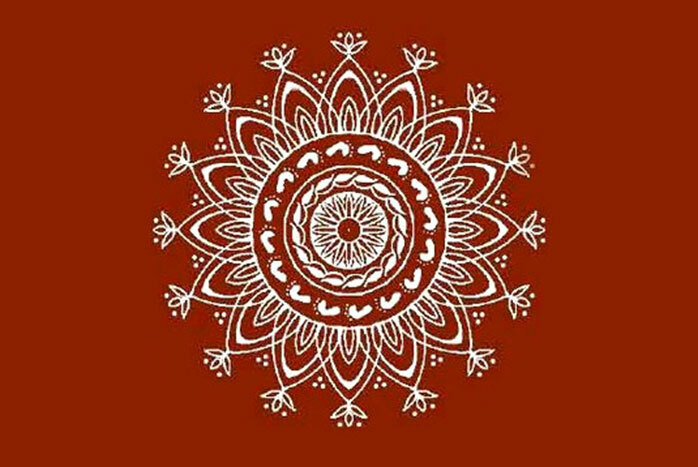 Presently, the influence of Santiniketan style of art can also be seen in the Alpana patterns. 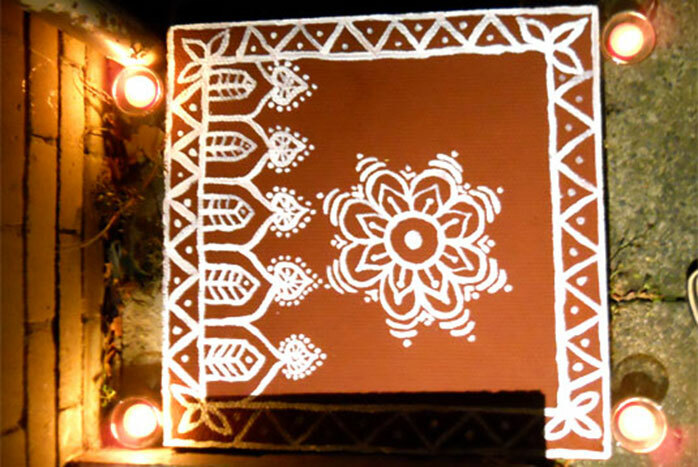 This rangoli is made with the help of a small piece of cloth that is soaked in a paste of powdered rice and water. These designs are passed on from one generation to the other even to this day.